Prime Minister Narendra Modi today expressed grief at the loss of lives in the temple stampede at Jharkhand’s Deogarh district. Modi spoke to Chief Minister Raghubar Das about the incident which occurred in the temple town at around 4 AM leaving 11 people dead and over 30 injured. “Pained at loss of lives due to the stampede in Jharkhand. My thoughts & prayers are with the families of the deceased in this hour of grief,” the PM said on twitter. Eleven devotees were killed and over 30 injured in a temple stampede at Deogarh early on Monday morning during the ongoing month of Shravan. The temple attracts maximum footfall on Mondays during the month. 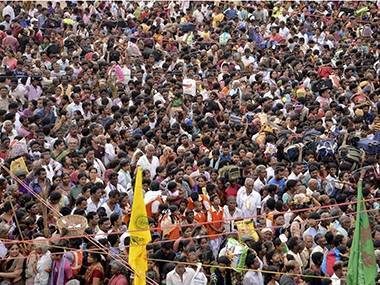 Over 1.5 lakh devotees offered prayers today. The incident took place near Belabagan Durga temple due to overcrowding. The queue was stretched to four-five kilometers from the temple as there was a surge in devotees lining up to offer prayers. Deoghar Sadar Hospital civil surgeon Dr Diwakar Kamat confirmed the number of those dead. “Eleven devotees mostly women died. Though we have to wait for post-mortem report, asphyxia is one possible reason”, said the civil surgeon. A compensation of Rs two lakh to the kin of those killed in an early morning stampede at the temple town of Deogarh. The injured would be given Rs 50,000, an official statement said here. A stampede outside a Hindu temple killed at least 10 pilgrims in eastern India early today after a surge in the kilometers-long queue of up to 150,000 people. Police said devotees rushed towards the Baidyanath Jyotirlinga temple complex in Jharkhand state after news circulated that the doors were opening. Those sleeping in the enormous queue were trampled in the crush after first prayers between 4:00 and 4:30am, said SN Pradhan, additional director general of police in Jharkhand. Pilgrims had massed overnight. Today is considered an auspicious date to visit the complex, which includes a main temple and 21 smaller ones devoted to Shiva, the god of destruction. “The first prayer ceremony is conducted by the temple priests and then the doors of the temple are opened for the devotees,'' Pradhan said. “Many tried to rush to the head of the queue which led to chaos and as some of them fell, the devotees got trampled,'' Pradhan said. ``Ten people including one female devotee are now confirmed dead. Another 15 to 20 people have received injuries,'' he said. Pradhan said the queue was more than six kilometers long because it was Monday and it is the Hindu holy month of Shravan when devotees flock to temples around the country. 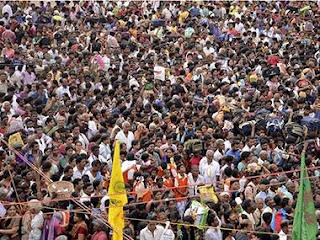 “Our initial estimates are that there were around 100,000 to 150,000 devotees there,'' Pradhan added.